In the picture above, north is towards the right and the image covers about 110.4 x 88.3 degrees. Image centre is located at 07:36:54.0, –38:06:50 (H:M:S, D:M:S, J2000) Astrometric data from Astrometry.net. Argo Navis (outlined in green) is a giant mythical sailing vessel afloat on the southern Milky Way. Much of this unweildy constellation is nowadays unseen from mid-northern latitudes, but because of astronomical precession more of it was visible in the northern sky in ancient times. The construction of this ship of the sky seems to have been an ancient Greek idea, and the constellation is listed as one of Ptolemy's original 48, but the only one that was not incorporated as a whole into the International Astronomical Union's 1930's formalisation of the constellation boundaries. One legend has it that the mythical ship was created for Jason, who sailed with the Argonauts in search of the Golden Fleece. The vessel was later refitted as an Ark to suit other beliefs, but in the 1760s it was broken up by the French cleric and astronomer Nicolas de Lacaille into the four sections we recognise today, Carina, the keel, Puppis the stern, Vela the sails and Pyxis, the mariner's compass. 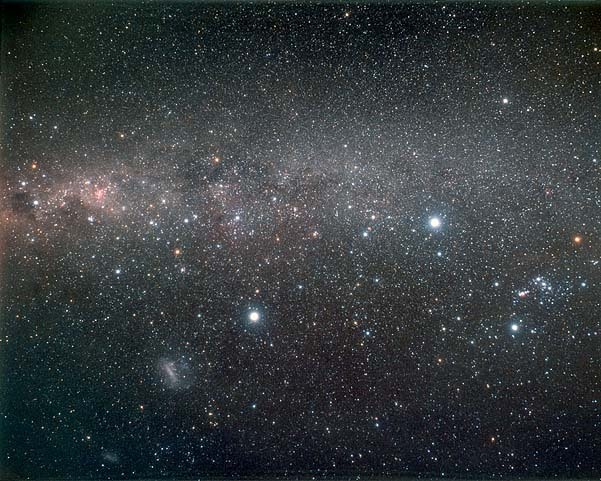 This photograph above shows a large part of the southern sky, from Crux to Orion, and includes the two brightest stars in the sky, Sirius and Canopus. Mouseover the image to see the modern constellation outlines, where the four constellations that were once Argo Navis are emphasized in green. Overlaid in register (in a pop-up window) on the same sky image is the Hevelius drawing of the great vessel, superimposed in register on the star field. The drawing itself covers a large area of sky, from Crux on the left to Sirius in Canis Major on the right and is probably better seen on this negative image. We also have a picture of Argo Navis superimposed in register on the modern constellation outlines. The engraving of Argo Navis is laterally reversed in these images, and is the work of Johannes Hevelius of Danzig (1611–1687). It was appeared with a remarkable series of 56 constellation drawings in his Firmamentum Sobiescianum, which was published three years after his death. The drawing (and the modern constellation outlines) have been distorted to fit the photograph, which is distorted (especially in the corners) by the wide field optics used by Akira Fujii on his 4 x 5 inch format camera. The stars on Hevelius' etching can be made to fit the star positions on the sky photograph very well, but the modern constellation outlines do not attempt match the representation of the ship closely. The sails of the ship (i.e. Vela) as sketched by Hevelius are where Pyxis (the compass) is, and none of Carina (the keel) in the drawing extends below the waterline. All this is probably due to the 1930s definition of the constellation outlines; before that their boundaries were quite vague. Though not formally part of Argo Navis, Volans (the flying fish) seems to be following the great vessel and the Large Magellanic Cloud could be imagined as a frothy wave raised in its wake.